“We all deserve a safe, stable place to live. But we’re not protecting this basic human need for millions of people around the world. This is the statement of solidarity the Canadian Alliance to End Homelessness signed with our international partners Crisis UK, the National Alliance to End Homelessness and FEANTSA. And it’s because every word of it is true. The homelessness crisis seems insurmountable, but there are people around the world working together to bring it to an end. That’s what World Homeless Day is all about—to bring the needs of homeless people to the forefront and provide opportunities for the community to get involved in responding to the crisis. Modern mass homelessness in Canada – and everywhere it exists in the western world – is the product of policy choices our countries, provinces and communities have made. We know from experience in Canada and around the world that the unnatural disaster of homelessness can be prevented and eliminated. It doesn’t need to be like this. The CAEH is honoured to be working with over 50 communities across Canada who are taking action on homelessness. We are supporting them to apply proven approaches like Housing First, data driven decision making and collective action to transform programs, policies and systems toward the goal of ending homelessness. Through our 20,000 Homes Campaign, our Training and Technical Assistance program and our annual (and upcoming and likely to sell-out!) 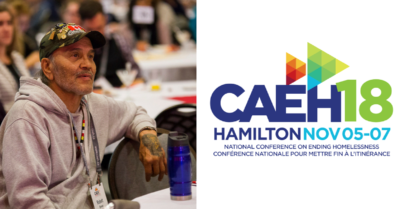 National Conference on Ending Homelessness we see a growing national movement that is beginning the end of homelessness in Canada one person and one community at a time. We know homelessness is a solvable problem and Canadians are taking concrete steps to get there, but we need your help. In the National Housing Strategy the federal government made an historic promise to recognize the right to housing in Canada. Remember – federal policy change 30 years ago helped create our housing and homelessness crisis. A legislated federal recognition of the right to housing will be critical to reversing it. It’s not right that 235,000 people experience homelessness across Canada and over 1.7 million people are living in unaffordable, unsafe or unsuitable housing. The time is now to solve Canada’s housing crisis and end homelessness. Join our call and write to your MP to make housing a right, visit: housingrights.ca. Check out what legal scholars and civil society experts prepared in draft legislation, offering up suggestions on how the right to housing could be incorporated into the National Housing Strategy. There are so many ways for you to get involved in the movement too. In the conversations you have with family, friends, and colleagues, to getting involved by volunteering, voting, advocating, or donating to local service providers. Advocate by contacting your elected officials and asking them to support ending homelessness. Volunteer! World Homeless Day focuses on thinking globally and acting locally. Educate yourself and others by learning more about homelessness and its solutions. Stay up-to-date by reading new research, check out our partners at the Homeless Hub, which provides a lot of easily understood research resources. Donate to your community organizations on the frontlines of the homelessness crisis. This World Homeless Day, let’s take meaningful action to end homelessness.